Experimentation and play are essential for getting to know a tool and discovering what works well within a design. But when it comes to creating something entirely new, it’s best to approach it with a well-thought-out vision of what you want the end result to be. If you select a technology from one of the resources included in one of The How To’s, you will have access to its guided lessons and activities that will help you get started. If you decide to explore new terrain through a tool or technology from another list, you will have to do a bit more planning. The Technology-Enabled Learning Activity Planning Document is is an example of one way to map out the planning process, but you might want to develop your own planning notes based on your preferences. If you decide to take the leap and start working with the tool, keep in mind that this requires dedicated time. If it’s your first time using the tool, go through any tutorials provided, or search for some online – undoubtedly there are others that you can learn from. Also reassure yourself that this prototype does not need to solve the learner challenge entirely – perhaps it is just one aspect of the challenge that you’ve uncovered. Start small. That’s the whole idea behind prototyping – you create what is known as the “minimal viable product”. 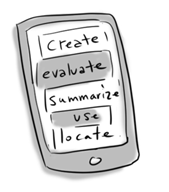 You can always take a cautionary, but equally valuable approach by mocking up your prototype using post-it notes. 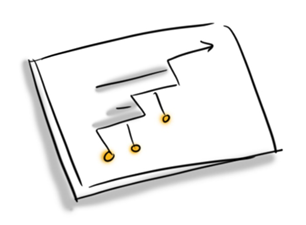 Post-it notes can help you storyboard and prioritize the sequence of interactions that support the use of your technology. You can add steps in and move them around, and ultimately end up with a series of instructions that can help frame the activity for your learner. Do you have any ideas for me to consider? You may want to use the Design thinking Feedback grid pdf form – it’s fillable or you can print it out. Based on their responses, you can now take the necessary steps to synthesize that feedback in order to refine your creation. And it’s important to recognize that often it isn’t practical or beneficial to fix every perceived issue from your users. You might want to take the feedback received and prioritize it based on feasibility and how it works to evolve the best solution for your learner challenge.